Turns out, The Trade wasn’t really one for one. For the New Jersey Devils, it was Adam Larsson for Taylor Hall, Nico Hischier and maybe now Jack Hughes. Because Hall isn’t just a Hart Trophy winner. He is the Draft Lottery’s MVP. Hall struck again on Tuesday night, helping deliver the 2019 No. 1 overall pick to New Jersey, as the Devils moved up from No. 3 to the top spot and earned the right to select either Hughes or Finnish prospect Kaapo Kakko in June. The New York Rangers will land whomever their Hudson River rival does not select when they pick inside the top three for the first time in franchise history, moving up from No. 6 to No. 2. The Chicago Blackhawks climbed from No. 12 all the way to No. 3, leaving Colorado and Los Angeles as the big lottery losers. The Kings fell from No. 2 to No. 5, while the Avalanche slid from No. 1 to No. 4 for the second time in three years – in lotteries both won by the Devils. The consolation prize for the Avalanche that year was Cale Makar. The consolation prize this year will be that they’re the only lottery team to skate in the Stanley Cup playoffs. They certainly could’ve used Hall’s magic touch. Tuesday night marked the fifth time in his nine years in the NHL that Hall’s team won the lottery. It’s six if you include the first overall pick the Oilers used to take him in 2010. The Devils had an 11.5 per cent shot to move up to No. 1. Their winning combination of lottery balls was 12-4-2-10. Once the first three balls came out 12-4-2, the Devils had a 36 per cent shot at No. 1 pick on the final ball (four of the 11 remaining possible combos). The Flyers also had three, while the Canucks, Kings, Avalanche and Rangers were all still alive as the final ball was plucked. Yes, the Canucks had about a nine per cent shot on the final ball to land Quinn Hughes’ kid brother. Devils GM Ray Shero knew it was on there already. Shero revealed after the Draft Lottery that a reporter asked him at the GM Meetings last March whether he considered trading Hall at last February’s trade deadline. Hall may end up being the real winner here again. The ability to add another skilled player could go along way toward giving him something to think about this summer as he enters contract talks with the Devils. Hall, 27, has one year remaining on a seven-year, $42 million pact signed with the Oilers. He can sign an extension in New Jersey as early as July 1, but there has been growing speculation about his trade availability, as Shero alluded, if the two sides are unable to come to an agreement. "Great start to the summer for the Devils," Hall tweeted after the lottery win. Hall never got to make a defence of his Hart Trophy, his season ended with knee surgery in late February after posting 37 points in 33 games through Dec. 23. Hughes said the Draft Lottery was a night where he could start to envision putting on a team’s uniform. If it ultimately comes down to a tie between Hughes and Kakko, the Devils may go with the Devil they know. Because the connection between Shero and the Hughes family runs deep. Before he worked in front offices, Shero was a player agent in the late 1980s and one of his clients was a minor league defenceman from Providence College, Jim Hughes – Jack and Quinn’s father. “I’ve seen Jack play a long time,” Shero said. “I know his dad well and his mom … We certainly recognize that Jack’s a great young player. Everybody can see his skating is obviously incredible. His instinct, he’s selfless on the ice, he’s a team player, he’s a centre, he’s just got talent and upside to his game. You can see he can get stronger and stronger but his instincts are so good. It’s fun to watch. 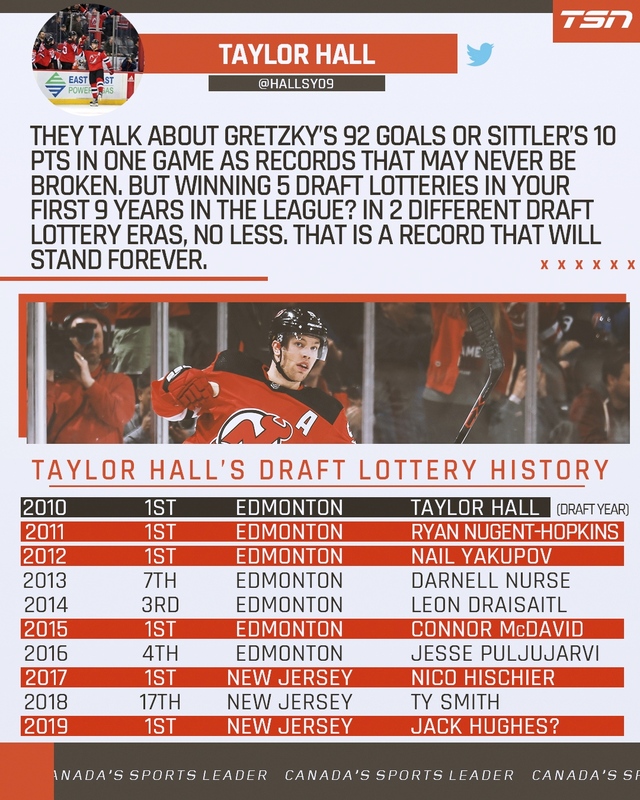 Hall tweeted that the "heater" he's been on is like winning 10 times the amount of money you walked into the casino with. He's just hoping he never needs to tap into his lottery good fortune again.